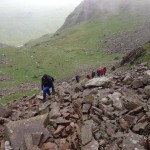 The team was called out to search for a pair of teenagers who had failed to return from Scafell Pike. Whilst we were heading to the fell they turned up at Wha House Farm in Eskdale having descended into upper Eskdale by mistake. 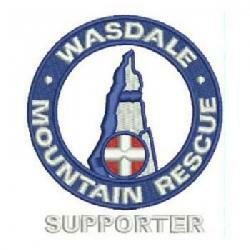 The team was contacted about a missing group on Scafell Pike. Whilst we were investigating they turned up in Eskdale. We were contacted by Police about a man on the 3 peaks who was struggling to descend Scafell Pike due to a knee injury. He was given pain relief on scene and then stretchered down to Brackenclose. Incident closed 09:30. 13 team members involved. 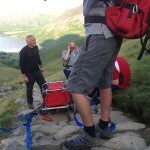 The team was called out at around 05:00 to help a female walker who had a suspected broken leg on Scafell Pike. 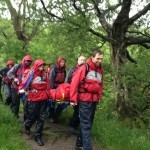 She was treated by the team and transferred by stretcher to an ambulance waiting in the valley. We were contacted about a party of eleven 3 peakers reported overdue by their driver at Seathwaite, Borrowdale. It turned out that the party had descended into Wasdale by accident and had tried to contact their driver but the message didn’t get through due to poor mobile phone reception.